The Kluane Chilkat International Bike Relay continues to be a highlight of the year for many cyclists in Yukon and southeast Alaska. 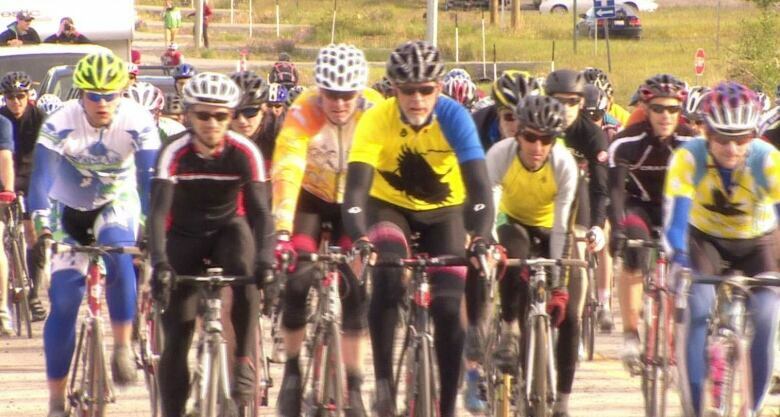 The annual Kluane Chilkat International Bike Relay race celebrates its 25th anniversary Saturday with more than 1,200 riders participating in the 240 kilometre race from Haines Junction, Yukon, to Haines, Alaska. Board president Rob Welton credits active cycling communities in Yukon and southeast Alaska — and striking mountain scenery along the race route — for the race's continued popularity. The race grew rapidly after it began in 1993 and was then capped at around 1200 riders in the early 2000s, he said. "We'd watch how things were flowing and realize we need to limit things just for safety reasons," said Welton. He says the most risky part of the race is around the first two checkpoints where traffic congestion is worst. A potential danger this year is cold, wet, weather that could dump snow on the Haines Highway, particularly at the summit where the elevation tops 1,000 metres. The Environment Canada forecast on Friday afternoon predicted flurries on the highway for Saturday morning beginning at 900 metres elevation. "As long as there's no snow on the road that's staying on the road, then we can let it run through," said race coordinator Mike Kramer. But he said if the snow is sticking it will be too dangerous for the skinny tires on road bikes and riders will have to move past the slippery section in vehicles. If the weather is not too wet in Haines Junction, the race will begin with the firing of a cannon.